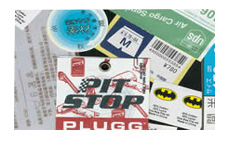 S.N COMPANY has been committed to producing the finest printed labels. We’ve been helping customers,both big and small, produce high quality labels that help differentiate their product in the marketplace. We also produce customized and in stock care and content labels to help customers abide by federal labeling requirements. Not only do we use the most advanced printing equipment, we also use special inks created with high quality printing in mind. These inks offer superior resistance to abrasion so they do not wash out during normal laundering, dry cleaning and even exposure to difficult environments such as stone washing.